Following a night of thunder and lightning, rain has been pouring down this morning. A gentle reminder Spring is on its way. This months giveaway "Heart Today" is a reflection of love, his and hers, hearts, swirls and spring pastel flowers. To win simply leave a comment and tell me one of your favorite things about Spring. I will choose a random winner Monday night. This morning has sprung upon us with ease. Last night rain and thunderstorms led to the cancellation of our weekend baseball tourney. So that means today is a day of R&R. That also means I have a little computer/blogging/creating catch up time. So without further ado: I have a NEW freebie for you. Click on image to download. Enjoy! Sorry, download no longer available, and has been downloaded 157 times. 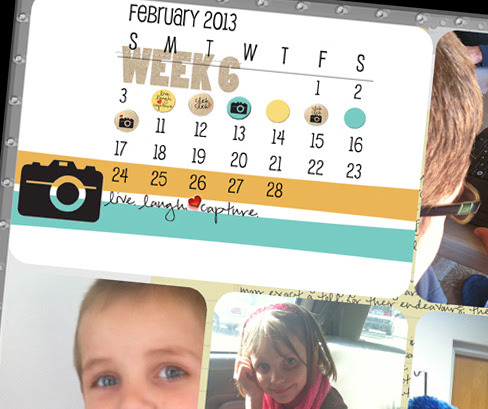 Hello Digital Project Life | Week Six. My less favorite thing to do is play catch up with this project. My most favorite thing to do is enjoy the process of this project every chance I get to record another week. Here is a look at the open digital album. click on the image for a clearer view. I used a journal card from my Capture digital scrapbook collection as the title card. Adding the calendar on the weekly title card is a fun way to highlight the specific days of the appropriate week. Again, I used some elements from my Capture Collection. The week six element is from my 52 weeks in chipboard set. I blurred out the journaling about my Aunts doctor visits again this week. Here I added a digital insert. A scanned the front of a card I received from my Aunt. For the digital plastic I simply cropped down a 12x12 size, purposely leaving the top to appear it had been cut, then I added some stitching to seal it shut. :) no sewing machine required. I scanned the inside of the card. Then added a scan of the envelope front as a separate layer on top the left side of the card. This is one of the many reasons I absolutely love digital memory keeping. No boxes crammed full of ephemera to stow away. Ruger was feeling a bit under the weather this week. This is when the flu was spreading around like wild fire. We managed to get flu shots and gratefully escaped the bug. But for Ruger, cough syrup and couching was definitely the highlight of his week. Top left corner is a snapshot I took on my phone while in the ER with my Aunt. The elements used on this page is from my Capture Collection. Don't quit. There are bound to be ups and downs as one attempts to document everyday life. But this year hit a real rough spot. A mountain my family is facing, prayerfully. I can only remind myself that as I document this journey in the weeks to come, I will have captured all moments meant to be remembered. While the weeks may be full of emotional times, there are many happy moments as I press through everyday routine. I choose to find and document those! Please continue to keep my family in your thoughts and prayers. Supplies: Digital Project Life templates, Digital Plastics, Open Album Design Melanie Britt | Digital Project Life Editions Becky Higgins Not a Digital Memory Keeper? Find the Traditional Project Life Editions Here | 52 Weeks in Chipboard Melanie Britt | Elements used as calendar day markers Capture Collection Melanie Britt | Wanna know more about Project Life? Start here. Follow me on Twitter @Melanie_Britt Instagram @melaniebritt as well as the hashtag #digitalprojectlife. Hello Week Five. Click on any photo for a clearer view. A full week indeed. This has been the most difficult week ever to record. I totally get why this project can close for so many. Believe me I struggled with it. Nevertheless, I pushed forward- mission complete- documented and I'm so happy I did. Continue reading for more details. I used some Pink Paislee digital elements to highlight the dates for the week. 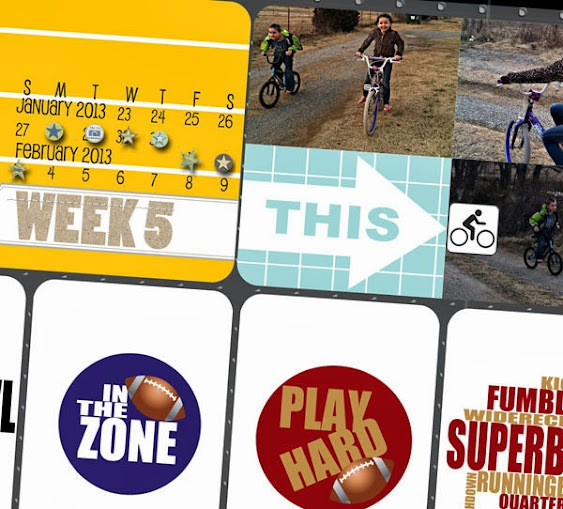 I created the Super Bowl filler cards, I offered as a freebie on my facebook page. If you are interested in them, contact me and I'll send them to you directly. Good times. Sub sandwiches. Even a little nice weather this week. A day full of bike riding barefoot and pretending winter will never come. I joined Ali Edwards in documenting the last day of the month. I plan on continuing this in the months to come. May not always be the last day, but will be during the last week for sure. I created my own 6x12 template. Love that this particular day I was able to capture the sunrise and sunset. I created a 6x12 collage template for eighteen photos with three columns for morning, afternoon and evening. Simple snapshots that compliment the day detail list on the cover page. You can read the story behind this page: Here. To note: I had a comment awhile back asking me on how I scan in my written documents. This was even printed in the Project Real Life e-book. This is NOT the case. Confession: When I use "real life like" papers in my digital album they are NOT scanned with my handwriting. They are 100% digital. I have created many different papers, legal pad look, notebook paper, torn worn scrap papers and so on. You'll notice these throughout the album. Right side: I chose to blur out the journaling on this page. How I felt it important to document for my family, the words are very personal and not meant for the entire world. I hope you'll understand as I move forward through this journey. 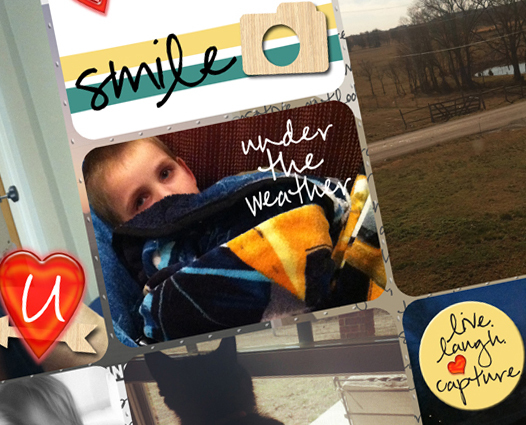 I balanced out the emotional journaling with random smiling snapshots. My thoughts for fellow project lifers on what to do when life gets rough: Don't quit. There are bound to be ups and downs as one attempts to document everyday life. But this year hit a real rough spot. A mountain my family is facing, prayerfully. I can only remind myself that as I document this journey in the weeks to come, I will have captured all moments meant to be remembered. While the weeks may be full of emotional times, there are many happy moments as I press through everyday routine. I choose to find and document those! Supplies: Digital Project Life templates, Digital Plastics, Open Album Design Melanie Britt | Digital Project Life Editions Becky Higgins Not a Digital Memory Keeper? 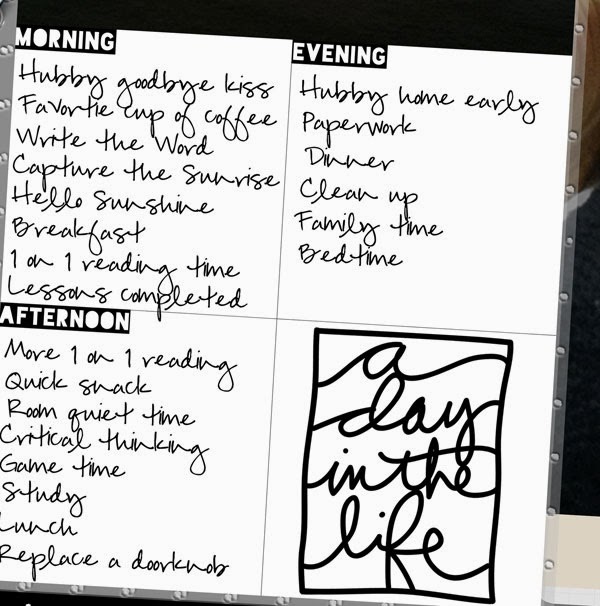 Find the Traditional Project Life Editions Here | 52 Weeks in Chipboard Melanie Britt | Super Bowl filler cards, Day in the Life templates Melanie Britt | Elements used as calendar day markers Pink Paislee | Wanna know more about Project Life? Start here. 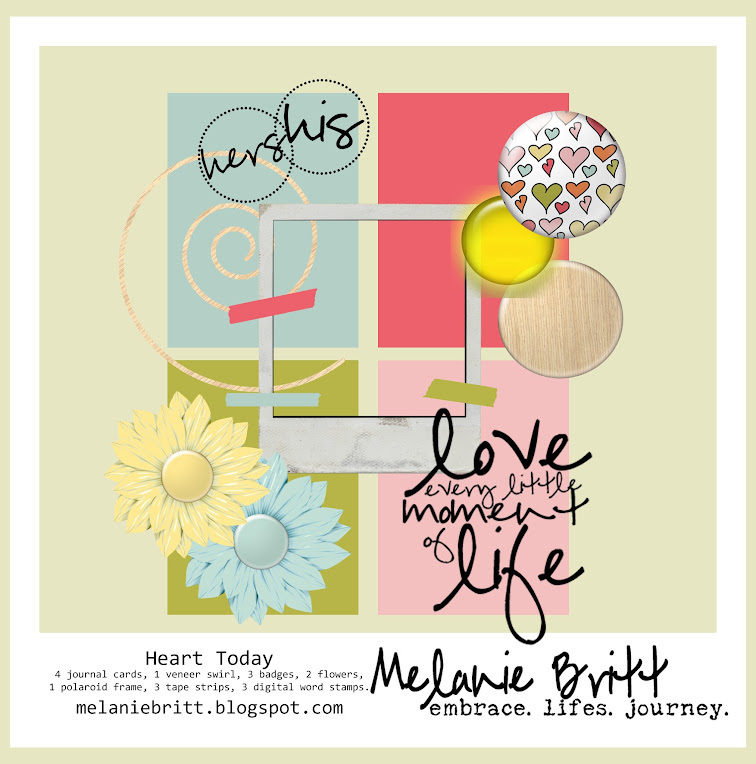 Follow me on Twitter @Melanie_Britt Instagram @melaniebritt as well as the hashtag #digitalprojectlife.